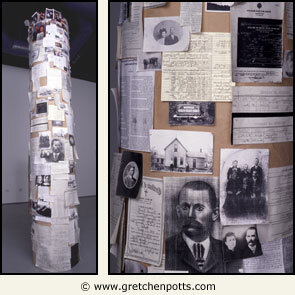 Cardboard covered tube with photocopied documents (on parchment paper) and pictures (on matte photo paper or color photo paper) placed in ascending order of my family history. The bottom starts with family history dating back to the 18th century and proceeds upward to present time. Detail showing old portraits, genealogy charts, pictures of grave sites, marriage licenses, death notices, family portraits, etc.